Ceding to protestors' demands, Ukrainian parliament members voted last week to impeach President Viktor Yanukovych and hold early elections, which have been set for May 25. Online "slacktivists," keyboard warriors and various media outlets responded by breathlessly declaring the situation a "revolution" -- and in some cases even proclaiming it a successful one. Except that it isn't at this point. Far from it. Proponents of freedom and democracy would love nothing more than for Ukrainian citizens to fully control their own destiny. However, mere wishful thinking is no substitute for manifest reality, and semantics shouldn't replace substance. Otherwise, there's a danger of never actually getting anywhere. There are historical standards for revolution, and they shouldn't be lowered just because those standards predate the advent of social media. Some have already made that mistake in the case of Ukraine. The "Orange Revolution" of 2004 was prematurely named, then prematurely declared a successful revolution. In retrospect, it was merely a rebellion -- and ultimately a misnomer. If it had been a revolution in substance, the country would not be where it is now, with parliament having to reinstate the Orange Revolution constitution that was adopted in 2004 but then gutted by a constitutional court in 2010. There's a reason that the French Revolution started, rather than ended, with the storming of the Bastille on July 14, 1789. It wasn't considered complete until 10 years later. A revolution, by definition, is the replacement of one political system by a significantly different system. In the case of an authoritarian or totalitarian status quo, it has always required many phases of rebellion over a number of years, and much bloodshed. The only revolutions that end quickly are those that result in totalitarian or authoritarian regimes, as with the Cuban Revolution. Democratic revolutions are much messier. Moreover, they inherently require democratic legitimacy, which is why even a democratic rebellion such as the one in Ukraine needs to occur within the context of an election cycle and be ratified through a democratic process. Democracy can't start ironically with a coup. The results of the May 25 elections will retroactively determine the democratic legitimacy of the rebellion. For Ukraine to meet the successful revolution test, it must implement a systemic change rather than just substitute one leadership team for another. Otherwise, it's simply a case of the same corruption and problems playing out with new actors. Ukraine's revolution could be declared successful if its political system and laws were harmonized to the point where the country gained acceptance into the European Union, thereby representing a full transformation from Russian protectorate. It's all still a long way off at this point. Not to say that corruption wouldn't still exist in Ukraine, but the kickbacks and corruption would run through the European Parliament, the way it's done in the rest of Europe. 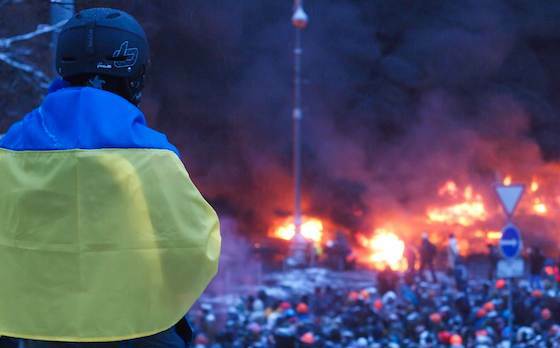 Cynicism aside, this begs a critical question: Does the Ukraine really want a revolution? I'm not being facetious. Consider that since its inception in 1867, my native Canada has never experienced a bloodstained revolt for its independence from either of its two founding nations, England or France. Both official languages are constitutionally enshrined, and Canada enjoys warm relations with both countries. Canada now has free-trade agreements with the U.S., Mexico, Europe, Israel, Chile, Costa Rica, Peru, Colombia, Jordan and Panama, as well as bilateral economic cooperation and investment agreements with China and others. Ukraine may want to avoid a revolution for the same reason that George Clooney doesn't want to commit to any one woman. When you're that sought after, why tie yourself down? Ukraine can position itself to exploit its geopolitical love triangle with Europe and Russia, and play the field on its own terms. Anyone who's ever done business in Ukraine knows that kickbacks and corruption among the elite are par for the course. If you want anything done, palms need to be greased. Among the duties of the business intelligence firms operating in Ukraine is to determine which palms require greasing in any given situation. Yanukovych's palatial mansions are a testament to this. So what would happen if the Ukrainian people simply eliminated the corruption without making a binding commitment to either the Russian or European sphere? Would it increase the standard of living inside the country without the difficulty of such a black-and-white choice? Take it from a native Canadian, dear Ukrainian friends: No one says that you have to get married geopolitically. "Ukrainian Uprising is a Rebellion, Not a Revolution"